In Lesson 6, Saroj teaches you how to play Nepali (Jhyaure beat) rhythm. Four commonly used major chords: A major, D major, C major and G major are also taught in this lesson. Playing note in progression, called soloing is great fun once you know how to do it. Learn with Samyam, how to use alternate picking and train your fingers to adapt to the fretboard. This tutorial includes a brief introduction to C Major scale and ends with a demo jam session along with Sabin and Samyam. Listen to our backtrack on C Major scale and practice some soloing along with it. Thanks to Sabin for creating this wonderful background track. 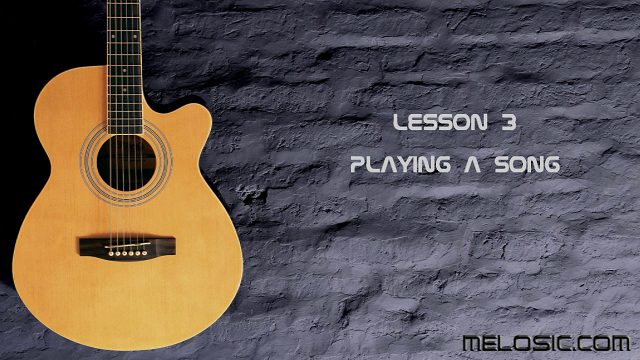 If you are following our tutorials from the beginning, you must have known the importance of playing chords accurately. So in this tutorial, we are going to look deeper into reading chords diagram and playing them properly in your guitar. Here, we start with simple A major chord and later focus to barre (or bar) chords, mainly F chord which is considered as a hurdle for beginners. Follow this tutorial and practice the chords regularly. With some time and practice, you’ll master these chords and you won’t be barred anymore. Best way to learn guitar is to learn by practice. Realizing this, we are skipping our theoretical lessons for this time and going to teach you how to play a song. The song played in this lesson is Boulevard of Broken Dreams by Green Day. It has really simple chords and is easy to play for beginners. The chord playing technique, strumming patterns and best practices discussed in this lesson will be useful for any song you’ll try. So grab your guitar and get ready to dive into the real action with Samyam in this video. Tuning the strings of your guitar to the correct notes is very important. Not only for good sound, you should always practice on a well-tuned guitar so that your ears (read: brains) are always trained to hear the right sound.